Whenever there is a need for battery-powered lighting, like for camping, solar powered cottages, cars, boats, planes, or emergency purposes, fluorescent lamps have a great appeal. Firstly, they are very much more efficient than glow lamps, so they produce much more light for less power consumption. Secondly, their light color stays constant while the battery runs down, while the color produced by a car lamp, really designed for 13.8 Volt, is very yellow-orange under the typical battery-light conditions: 12 V at the battery, minus the voltage drop on some meters of cable, usually results in only 11 V or so at the lamp. This has lead to many manufacturers producing fluorescent lamp drivers for battery use, generally accepting input voltages of 6, 12, or 24 Volt. Also there are a lot of complete fluorescent lights available, powered by flashlight batteries. But most of these cheap things have a quirk: They don't drive the fluorescent tubes correctly, resulting in low light output, and an efficiency that is not so much better than that of a glow lamp. The manufacturers are not to be blamed for this: The culprit is the public, which prefers buying the cheapest thing available, instead of checking for specifications and paying 20% more for something that is 200% better. 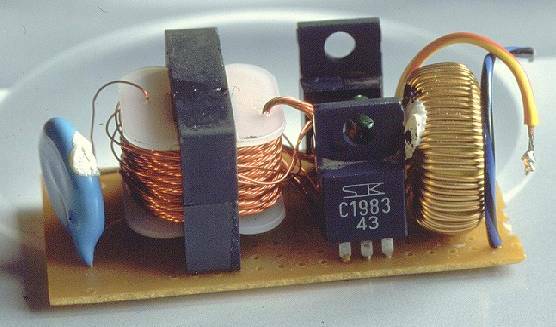 In this article I will offer a little insight, and offer three drivers for 12 V that I'm using myself: One for 20 Watt, one for 8 Watt, and one that puts 2 Watt into a 4 Watt tube. A typical fluorescent lamp is basically a glass tube, filled with low pressure mercury vapor and a mix of additional gases, and having a filament at each end. The glass tube is internally coated with fluorescent salts. In use, an arc forms in the tube, the mercury emits ultraviolet light, this excites the fluorescent substances, which in turn produce visible light. The exact color of the light depends on the mix of different fluorescent substances used. From an electrical point of view, such a lamp is a terrible thing to drive. While it is off, the gas does not conduct, and the cold filaments have a very low resistance. The first thing when powering up a tube is putting a rather strong current into these filaments, at very low voltage (2 to 4 V is typical). When the filaments have heated up, the tube needs a high voltage pulse to ionize the gas. Depending on the length, type, age and temperature, the voltage required can be anything from about 100 to 10000 V. Once the gas ionizes, the voltage breaks down dramatically. From then on, the tube needs a controlled current of typically 0.1 to 0.3 A, depending on its diameter, at a voltage that depends on length and other factors, and averages to about 100 V per meter of tube length. The current must be reasonably controlled, which isn't easy, because the tube exhibits negative resistance: Increasing the current decreases the voltage drop! And it must be AC, because otherwise one filament cools off while the other overheats, evaporates and darkens one end of the tube. For office lighting, many years ago some electrical engineer found a simple way to satisfy these needs: A series circuit is made from the AC power line through a ballast inductor, one filament, a starter device, the other filament, and back to the AC line. At first the starter has a closed contact, and the ballast limits the current that flows through the filaments. They heat up, and so does a bimetal in the starter. Suddenly the starter opens. If this happens while the current in the ballast was near a peak, a high voltage pulse is produced by the magnetic field collapse, and the tube ignites. If it happens near a current minimum, the tube doesn't ionize fully, the current ceases, the filaments and starter cool off, the starter closes and the cycle starts anew. This leads to the well known flickering when switching on such a light. Once the tube has ignited, the ballast limits the current flowing through the tube, the tube works steadily, and the starter contact keeps open because of some heat generated in it by a fill of neon gas, which glows together with the tube. A simple circuit, exhibiting a rather sophisticated behavior. How can we do this electronically? Semiconductors are needed to produce the required high voltage from a battery. But semiconductors don't like high voltage spikes! The following sections will show you how I did it, but there are many other ways too. Here is the schematic diagram for a 20 Watt driver. I developed this circuit in 1985, and used it to build a lamp that found much use both as camping light and as emergency light during the then-frequent power outages. The two transistors work as a push-pull oscillator. To avoid crossover conduction, during operation the bases are self-biased to a slightly negative voltage by the 1R5 resistor. The 220uF capacitor gives strong positive bias during power-up, in order to get the oscillator started. 2k2 resistor's only purpose is discharging the capacitor when the circuit is switched off, so it will restart the next time too! I used a ferrite core salvaged from an old 12" black and white TV flyback transformer. I wound the primary and feedback windings on one leg of the core, and the windings going to the tube on the opposite leg. This arrangement is crucial for the circuit to work! The only ballasting action in this circuit is the imperfect magnetic coupling between the primary and secondary coils! You may be wondering about the "ionization antenna" in the schematic. This is simply a piece of wire that runs along the entire length of the tube. You can stick it there with tape, or you can string it from socket to socket, like I did. How it works: When applying the 12 V, the 220uF capacitor biased both transistors into conduction. Due to the positive feedback they start oscillating immediately at a frequency of a few kHz, producing an audible sound. The tube is still in high impedance, so the coupling to the secondary winding is quite good. This applies 4 V to each filament, 150 V between filaments, and about 400 V between the tip of the ionization antenna and the tube end. These values are valid for RMS, but there are higher switching transients. The transients are high enough to ionize the tube right from the first moment, and it will exhibit a dim glow. But it takes only one half to one second for the filaments to heat up. As they can now emit more electrons, the already ionized gas breaks into arc discharge less than a second after applying 12 V power, and the circuit enters its normal mode of operation: The heavy secondary load makes much of the magnetic field close through the air. This reduces the coupling between the two sets of windings, and at the same time changes the magnetic characteristics enough to shift the oscillating frequency high into the ultrasonic range, making the sound disappear. The tube will run at about 70 V between filaments, and each filament will keep only about 2 V across it. Try to get the exact type of transistors. If you cannot get them, you may have to experiment with replacements. Switching speed is crucial, because if you use slow transistors you will get cross-conduction, which cause very high loss. The ferrite core I used has a cross sectional area of slightly less than 1 square cm, and a path length of about 20 cm. These rather slender cores were usual in old TVs. You may have to tweak the 1R5 and 2R2 resistors, depending on the specific core you use. Select them so that you get a current drain of slightly less than 2A at 12V. If the efficiency is right (not too much heating), you will be putting about 20W into the tube. This circuit is not a clean design. It has worked for me, I have used it for several thousand hours, still on the original tube, but I had to devote some time to tweaking the values. It is a bit touchy, and the efficiency is only about 80%, which means that you must bolt the transistors to some kind of heatsink. In addition, this circuit does generate some RF noise, so it's not a good idea to use it in the immediate proximity of a sensitive receiver's antenna. On the good side, the 20 Watt tube seems to burn a lot brighter than in a standard AC fixture. Somewhere I read that high-frequency driving increases a tube's efficiency. I cannot explain how it does so, but it seems to be true. And the visible flickering of fluorescent lights powered from 50 or 60 Hz is absent here, due to the high frequency. I wanted a small fluorescent lamp with built-in battery that could be used for camping. It should be reasonably small and lightweight, and give good light for many hours on a single charge. After some research, I settled for a 4 W tube, driven at the 2 W level, powered from a 12 V, 2.2 Ah sealed lead-acid battery that lasts for 10 hours continuous use and can easily be recharged in the car. Striving for the highest possible efficiency, I came up with the design shown in this schematic diagram. A CMOS hex inverter is used as an oscillator and driver for a MOSFET, which drives a high voltage autotransformer that feeds the fluorescent tube via a ballast capacitor. The circuit is very simple and small, uses just 8 components, yet it is extremely efficient (I could not measure the loss, it seems to be below 3%), and it drives the tube with true AC, despite the simplicity! The tube filaments are not explicitly heated. On powerup, the gas ionizes from the high voltage alone, and the small discharge that starts has enough anodic heating effect to warm up the filaments. Soon the discharge increases, generates a runaway effect, and less than a second after applying power the tube is fully on, working at the 30 V level, with the ballast capacitor limiting the current. This capacitor, a 3.3 nF, 500 V type, needs to be of very good quality. It has to work at a steady reactive power level of around 50 W, while dissipating as little power as possible. A capacitor Q of 1000 should be the absolute acceptable minimum in this application. Few ceramic capacitors achieve this, but many plastic caps do. Use a plastic (polyester) capacitor, and try it. If it gets warm, try a better one... Some ceramic capacitors may be so bad that the circuit just refuses to work. The transformer was made on a small double-C core (dimensions are on the schematic), salvaged from an old PC power supply. The core was originally used for noise filtering at the line input. As the ferrite works far away from saturation in this circuit, it exhibits very low loss. The entire circuit was assembled on a small printed circuit board, and integrated into a plywood box with the tube, reflector, and battery. No heat sink is needed, and no ventilation either. The power switch was mounted in a recessed location, to avoid accidentally turning the lamp on and depleting the battery. The lamp has been my companion on many a camping trip, and has been useful around the home too. This circuit should be possible to duplicate without trouble. The transistors used in this design are high-gain types. I just happened to have them on hand, salvaged from an old video recorder. You can use lower gain transistors, but then you must lower the value of the bias resistor (2k7 in my design). No heat sinks are required. The ferrite core (detailed on the printable version of the schematic, obtained by clicking on this one) is one that was not designed for saturation-limited operation at this frequency. 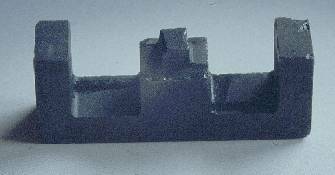 This kind of ferrite has considerable loss when operated at saturation flux densities at 25kHz, and so it gets very warm. It still worked well, but I was not satisfied with the performance. Not having a proper square-loop ferrite core in my material box, I came up with a solution that may well be an invention! At least I have not seen anyone using this before: The bottlenecked magnetic core! I used a Dremel tool fitted with one of the green grinding stones (designed for very hard materials) to grind off some of the ferrite from the center leg of one E-half, as shown in this photo. The effect of this is interesting and very useful: At low flux levels the core has almost the same effective permeability it would have without this treatment. But the small section remaining after the grinding has to carry the same flux as the thicker rest of the core, and so works at a much higher flux density. When the flux increases, this small section will saturate, while the rest of the core is still far from doing so. When the small section saturates, the core changes its behavior to that of an air-gapped core, drastically reducing its effective permeability! The result is that a saturation-limited oscillator built around this core will be controlled by saturation of just this little segment, while the rest of the core will work at a low flux density level. Only the small segment will run at the high loss level associated with saturation, while the rest of the core will work at a very low volumetric loss! Since the amount of saturated ferrite is so small, the losses of it are negligible, and the overall core losses are very low despite working in saturation-limited mode! Here is the completed circuit. Almost all parts were recycled from old equipment, which explains the white cement residues on the capacitor and the choke. Note that the primary winding is not made from one solid wire, but from several twisted strands of thin wire. This makes it possible to wind it around this small bobbin, and also results in lower AC resistance. I mounted this circuit into an aluminum canoe reflector made to size for the 8 Watt tube. This is very elegant, since the canoe is used as a return connection and ionization antenna, eliminating any visible wires. This circuit is technically the best of the three, being easily reproducible, quite uncritical, small and cheap, highly efficient and RFI-friendly.